The Social Network proved that you could make a movie about dudes who sit in front of computers all day interesting, but David Fincher isn’t eager to return to that overpaid, socially awkward well. After sitting down for a few meetings with Sony executives (and why not? The catering at those things is probably amazing), Fincher has turned down the offer to direct a biopic about Steve Jobs. No, not that one. The other one. 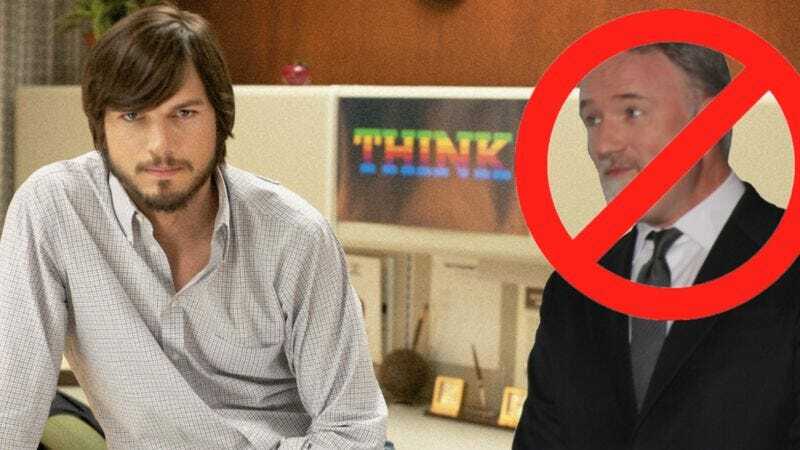 As previously reported, the script for this particular biopic is based on Walter Isaacson’s biography, as opposed to someone telling Ashton Kutcher he kind of looks like Steve Jobs. According to Variety, Aaron Sorkin finished the script earlier this year; as we first learned in 2012, it’s divided into three extended scenes, each taking place backstage at one of Apple’s much-celebrated product launches. Granted, it would have been cool to see Fincher reunite with his Social Network screenwriter on another story of difficult tech moguls, and once again combine his fluid tracking camera technique with what sounds like a script composed entirely of Sorkin walk-and-talks. At the same time, it’s a wise move for Fincher not to risk his career on an imitation that will inevitably pale before its mighty predecessor. All hail the One True Jobs!